Referring to BlackBerry’s hardware sales as “empty calories,” Goldman Sachs is wondering if the company should be making phone at all. 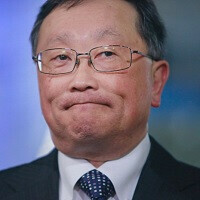 BlackBerry CEO John Chen is certainly pondering the idea of the enterprise becoming a software and services company. UBS is outright saying BlackBerry should exit the hardware space. Other money-types will be listening very carefully to BlackBerry’s fiscal fourth quarter and fiscal 2015 results, and 2016 forecasts on Friday. Estimates are floating the BlackBerry will post revenue of $790 million for the fourth quarter, which is 20% lower than the same period last year, and the worst sales number since 2006. Wall Street also expects net revenues to be written in red ink this time around. One of the demons BlackBerry is contending with is that many of its sales are arguably being deferred to the next year, a result of a delayed debut of the BlackBerry Classic, both directly from BlackBerry and carrier partners in various markets. Quarterly sales of as many as 400,000 BlackBerry Classic smartphones will be an item for Warterloo’s first-quarter fiscal 2016 calendar, not terrible, but it does not help in the here-and-now where Morgan Stanley says as few as 8,000 BlackBerry Passports and Classics have sold combined, though that is still up for debate. It does not help that BlackBerry’s margins on hardware are so lean it washes out other areas where the company is arguably positioning itself to make more money, such as software. BlackBerry CEO John Chen will be talking a lot about the road ahead for software and other services it hopes to monetize, like BlackBerry Messenger. Is this death knell for BlackBerry? No, but it reignites suspicions about the company’s relevance in the hardware space, an issue that John Chen has been working furiously to turn around. Could these numbers, and as a result investors, make BlackBerry reconsider its plans to release “several” new phones in 2015? That is a distinct possibility. I'm still waiting for your full touch screen flagship, BB. Dat face tho. This is what happen if you are unable to adapt to the changes in business and needs of consumer. Still BB is one of those smartphone that brings true innovation. I'm waiting for a keyboard flagship. And not the passport, the design is God awful for my tastes. And I simply cannot justify buying the classic to myself or anyone. I had a Q10, I wanted the classic, but there's barely any difference between the two. Phones that were released almost two years apart!!! I like that face. It's a mysterious poker face that made us wonder if BB really a failure, or he has a turn around success hidden well in his sleeves. BB is doing fine. You're the failure, Wahu. Because joining the Android bandwagon is helping Sony, Motorola, and HTC, right? If left up to Android fans, there would be no other OS for smartphones except Android. It's so funny how Android fans have yet to embrace Androids greatest strength: CHOICE. You talk as if "Android' is even the same thing across any brand just because they're all Android OS. Android essentially is the "same" across every brand, in terms of OS. Not everyone wants or needs Android, and that's evident by the phenomenal sales of iOS devices. Android is also not ideal or practical for every situation. Take enterprise and security, for example. Android is just not as inherently secure as BB10. Also, you can slap as many skins and overlays on it all you want, the underlying OS is still Android. You're right to a degree, but for much of the market, it's the variations of the user interface that they're looking at in regards to variety. No one can argue that each distinctive OS, Windows, BB, iOS, Android all have distinctive pros and cons that define the platform, but much of the market just doesn't know the difference, they just know the GUI and if they like it or hate it. True, but if everyone is already set with their favorite OEM and unwilling to try something different, how would it help BlackBerry? For example, how many Samsung fans are going to buy an Android flagship from Sony or HTC? Greed is the reason HTC and Sony are struggling. LG makes better phones and it's cheaper, Samsung likewise. Like I said earlier, greed kills companies. Imagine the price of M9 with a problematic chipset and they expect it to sell. It's not just possible also considering the fact that it looks almost the same like M8. M8 users won't upgrade and M7 users would rather wait for M10 or buy M8 or switch brand. The same thing is blackberry problem, you sell their products at a very high price. In my Country, passport is more expensive than(M8, S5 and G3). Who would buy that considering that fact that it lacks apps. I'm with you on pricing. Even I wish BlackBerry devices didn't cost as much. Although, considering the market they primarily serve, one can argue that you can't put a price on security. The app argument is so old and played. While the general publics perception concerning BlackBerry is that lack apps, the REALITY of the situation is that BlackBerry has all the apps one could want through BB10's ability to download and run Android apps OTA. I have four app stores on my Passport: BlackBerry World, 1Mobile Market, Amazon app store and the OFFICIAL Google Play Store. The only apps that won't work are those requiring Google Services, and there are alternatives for that in BlackBerry's own app store. Greed is also the reason that BB die. Just a couple days ago, Blackberry launch the classic in Indonesia. I ask my Indonesian friend on the reception of the classic. He said, "Great product, wrong price." According to him, no one in Indonesia will shell out a US$450 for the classic. That's just too damn expensive for small screen, old CPU. He said, it could sell with US$150, but not US$450. and Pride is also kill BB. If only they loosen up and sell both Android and BB10 device. Another thing is, my friend don't like the Amazon app store, he said, while some apps available on both amazon and play store, he said that the amazon store app sometimes has poorer quality compared to Google Play Store. So you based BlackBerry's supposed "death" all on this one "friend". Wow. He must be the most insightful analyst in the world. Or a fortune teller. You're naive to think that it's limited to one individual. The opinion of his "one friend" exists in countless other countries as well as back here in the US and Canada. And you're naive to think that he's doing anything other than trolling. Your opinion is wrong, Helena. They need to start making Android phones that rival the big players. Or just die. Android and Apple are just too big and Microsoft can still afford to drag Windows phone into the ground. No one trust Blackberry anymore. It amazes me how tech sites jump on the bandwagon of "doom and gloom" purported by these so called "analyst". It's even more amazing that the so called "techies" that frequent these sites all fall in line, believing what these analysts are reporting, even though these "analyst" are not basing their reports on truth. This is stock manipulation at its finest by the "short sellers". It happens every quarter when it's time for BlackBerry to post their earnings. I called it a few days back. What also amazes me is that it's mostly Android fans that yelling for BlackBerry to "choose Android or die", as if Android is the savior OS. If that were the case, then how do we explain Motorola? HTC? Sony? How do we explain Samsung's dip in profits? Tomorrow will tell the tale. Let's wait until then and stop with all the assumptions, shall we? Not surprising. I think the time to exit is now. I'm going to have to say I'm a little annoyed that I didn't think to post this. +1 to you sir. Don't get mad at me for speaking the truth. I'm also posing this question again to the plethora of Android faithful: If BlackBerry were to go full steam ahead and make Android devices, WOULD YOU BUY THEM? I think everyone with an Android device have expectations on what they want from their next phone, For me it's killer battery life and a stock or near stock experience. For others it's killer processor, top of the line camera, Infrared blaster, loud speakers... For me, I already know what phone I'll be getting next, the same goes for a lot of other people here. BlackBerry, if it were to start making Android devices, I think would still be a tough sell simply because much of the market already has a favorite brand. It might be possible that if they went Android then could release a killer flagship and sell it at near cost to grab the market's attention but it'll be a struggle no matter how you look at it. That's exactly my point. BlackBerry going all-Android would not help them anymore than them using their own, homegrown OS. What will help them, eventually, is if they continue to push innovation, play to their strengths and where they are strong(enterprise), and MARKETING. They need to market the HELL out BB10. But the latter won't happen until profits are higher. It's almost a catch 22. "MeanestGenius" -- It's interesting that nobody has answered your simple question. I would buy Passport with BB10 at $400. I might buy Classic with BB10 (might) at $250, after I had a chance to play with it. The Android on Blackberry suggestion is silly at the very least. The same posters that suggest BBRY should adopt Android would never buy Blackberry with any OS because that is already their ingrained hysteria. Those same children also don't understand that monopolies in the marketplace actually hurt all consumers.